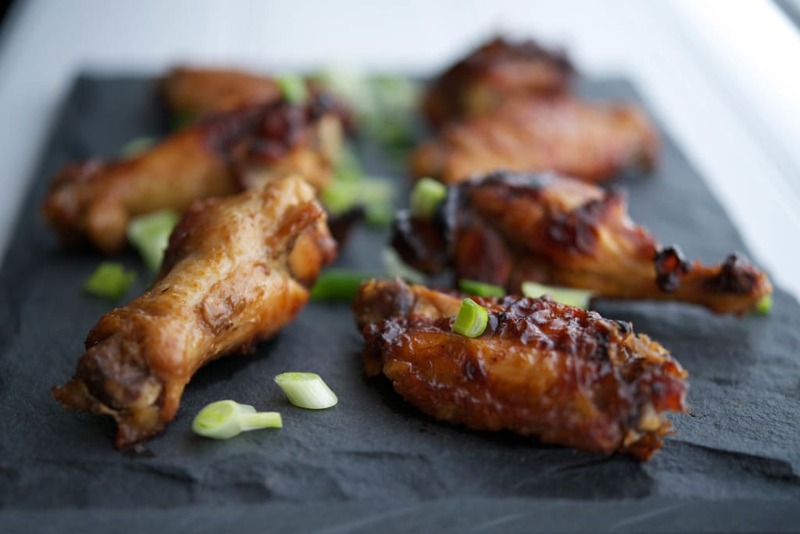 Make the sweet, popular North American Chinese General Tso Chicken dish a little healthier by grilling instead of deep frying. My family and I don’t eat a lot of Chinese takeout for dinner. Partially because there really isn’t a good restaurant nearby (we had one that was about 15 minutes away, but they closed) and we prefer the flavors of Japanese style hibachi over Chinese food anyway. 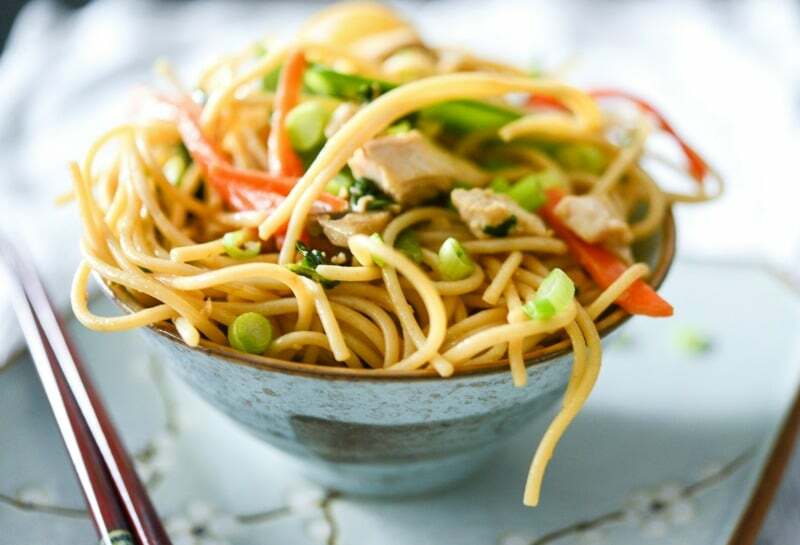 When we do get takeout, we generally get the combo Wonton/Egg Drop Soup, the kids like Lo Mein and my husband and I will get Moo Goo Gai Pan because it’s lighter. Every now and then we like to switch it up a bit and get either Sesame Chicken or General Tso’s Chicken; however, I don’t like how it’s deep fried so I decided to lighten it up a bit by making these Grilled General Tso Chicken Strips. 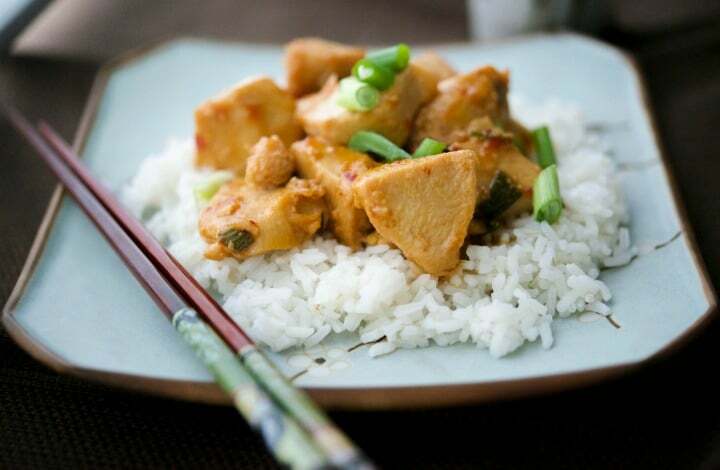 The flavors in this recipe are the same: sweet, salty, spicy and sour without having all of those extra fat and calories. 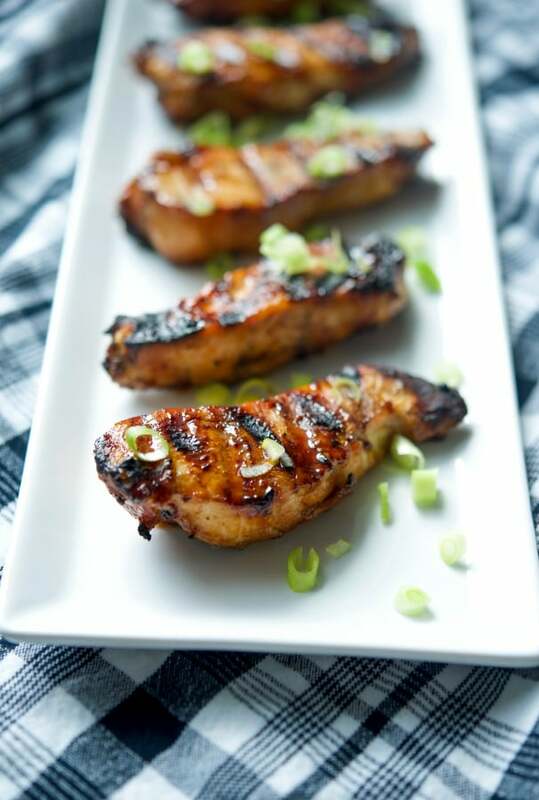 For this recipe you’ll need chicken tenderloins or boneless chicken breasts cut down into strips, soy sauce (I used low sodium), oil, ketchup, light corn syrup, cider vinegar, garlic, ginger and red pepper paste. First, combine the soy sauce and oil; then add it to a resealable bag or dish along with the chicken. You want to make sure all of the chicken is coated. 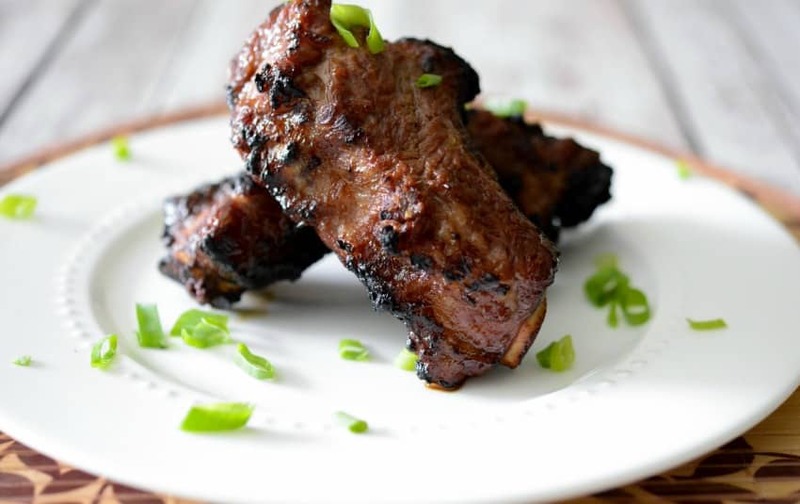 Place in the refrigerator for at least 2 hours to marinate. Next, combine the ketchup, corn syrup, vinegar, garlic, ginger and red pepper paste in a bowl and whisk until smooth. I used fresh grated ginger, but you can use half of the amount of ground ginger if you don’t have fresh also. 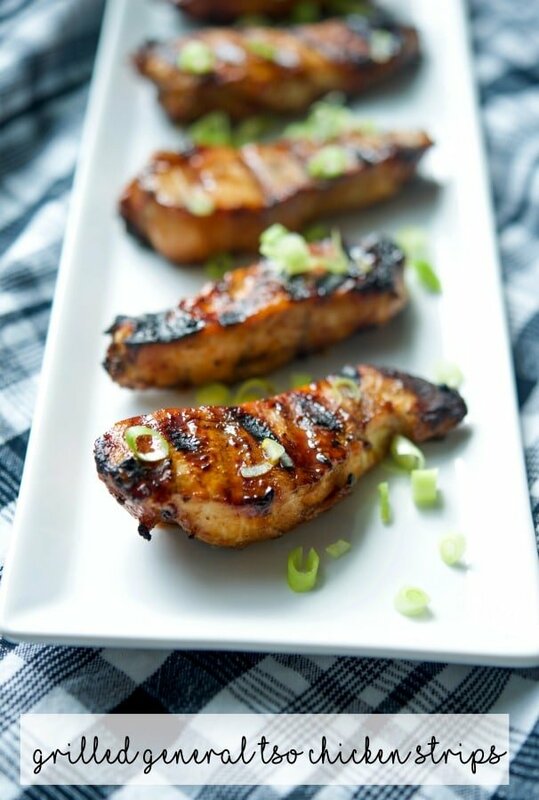 Heat your grill; then take the chicken out of the marinade which you can discard. Brush the sauce on top of both sides of the chicken and cook for about 10-12 minutes; flipping the chicken over and brushing the marinade on until it’s gone. Total cooking time took approximately 12 minutes, but time may vary depending on the size of your chicken strips and how hot your grill is. When ready to serve, sprinkle with sesame seeds or chopped scallions; which is how I served ours with some brown rice and steamed broccoli. 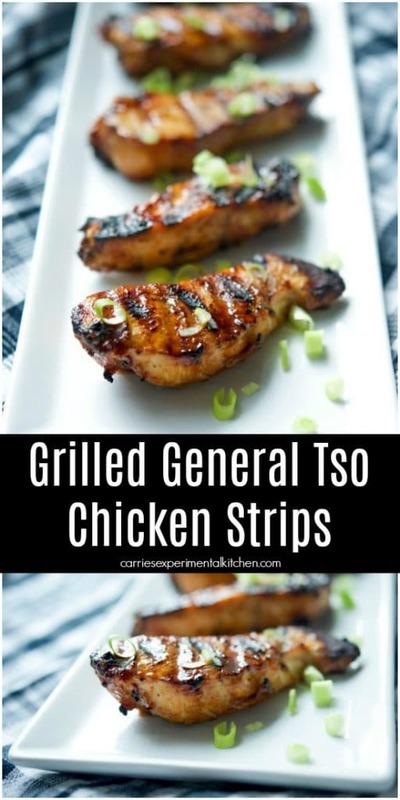 My family loved the flavors in these Grilled General Tso Chicken Strips and I liked that it was a healthier option. You can also adjust the flavors so if you like it a bit on the sweeter side, add more corn syrup. Like it with a little more heat? Add more red pepper paste. Make it your own! If you have leftovers, dice the chicken and make some fried rice too. ~Enjoy! First, combine the soy sauce and oil; then add it to a resealable bag or dish along with the chicken. (You want to make sure all of the chicken is coated). 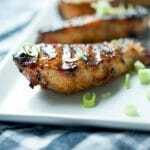 Place in the refrigerator for at least 2 hours to marinate. Next, combine the ketchup, corn syrup, vinegar, garlic, ginger and red pepper paste in a bowl and whisk until smooth. 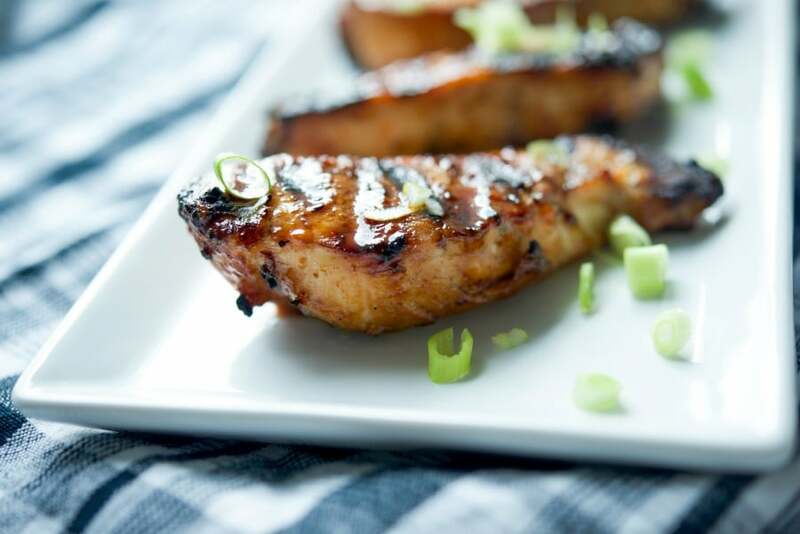 Heat your grill; then take the chicken out of the marinade which you can discard. Brush the sauce on top of both sides of the chicken and cook for about 10-12 minutes; flipping the chicken over and brushing the marinade on until it's gone. Total cooking time took approximately 12 minutes, but time may vary depending on the size of your chicken strips and how hot your grill is.